Hello my name is Jim and I would like to welcome you to our website. We know there are many martial art supply companies out there so we really do appreciate you giving us the opportunity to serve you. My love for martial arts made my decision to sell martial arts equipment pretty easy. I am a Korean American whose family has been in the Marital Arts industry for over 50 years in Korea. I myself have trained extensively as a youth in Taekwondo and very briefly in Jiu-jitsu. Although I do not have the time to train any longer, I've learned to incorporate the mental disciplines I was taught, into everyday life. I am positive that I would not have been able to achieve the success (as few as they may have been) without my martial arts training. Opening a new business was a very long and hard uphill battle but I believe it was my training that gave me the strength to endure these troublesome times. I turned a bad situation into a great turning point in my life. Now I view that moment in time as a blessing in disguise. I may have stayed with that company until I retired; had they not forced me to leave. This whole experience has brought me full circle into my current situation. With the Sales experience I have accumulated, I've learned the 3 key ingredients for success. 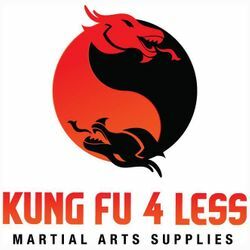 Kungfu4less is by no means the largest Internet Martial Arts supplier on the Internet, but I can assure you that we are one of the most competitive in price. Our Website is constantly being updated and if we see a lower advertised price on the internet, our policy is to beat it. No questions asked. Our profit margins are not as high as our competitors, but your repeat business will make it all worth while. Most orders do ship the same day using UPS unless priority mail if selected. We do not profit on shipping like most of the other companies, so standard UPS or Priority mail prices apply. Please read our return policy carefully before ordering. * An RMA number and return address with return instructions will be provided within 48 hours. * The customer is responsible for any shipping charges involved in returns and exchanges. * No refunds or exchanges are accepted for books, videos, customized items, and used or worn merchandise. * Promo shipping does not apply to exchanges. The full amount of the actual shipping charges will be billed for exchanges. * Please allow up to 3 weeks for the return and exchange. * No Returns will be accepted on Books Videos & DVD. Item being returned must be in New unused condition with original tags and packaging. Items in new condition can be returned or exchange up to 90 days of purchase. A 15% restocking fee will apply on returns only (restocking fee does not apply to exchanges). Returns after 90 days will not be accepted. Returned items must be in new condition with all tags and packaging or it will be returned at the customers expense. Uniforms that have been used, washed or altered in any way cannot be returned or exchanged. * If an item arrives damaged or defective, Kungfu4less will send out a new replacement at no cost. Please note, we do not send return label and issue refunds in this situation. This policy was implemented to discourage anyone from intentionally damaging an item to get free returns. Once the new replacement is received and you still want to return the item, you can follow the normal return procedure at that time. Once an item is used, it can no longer be returned to Kungfu4less. Many items have Manufacturer warranties so if you have an issue with item and you have only used it for a week, send us images and description of the issue and we forward the info to the Manufacturer. If there is a defect, a new replacement will be sent out by the Manufacturer at no cost. An RMA number will be provided within 48 hours. No returns will be accepted unless RMA number is visible on return package. Return items must be in its original packaging. Please include note letting us know your desired resolution. Returns for credit will be issued back to your credit card for the actual amount of the item(s) purchased less the 15% restocking fee. Shipping charges are not refundable. Please note our sizing chart is very general and is for reference only. We understand that people come in very different shapes and sizes and our sizing chart does not account for everyone. Please understand that our website operates on low margins which means we cannot pay for return shipping because the customer feels the item he or she purchased does not fit well. We will however correct any shipping error make by Kungfu4less. example - wrong size or item was shipped. We will also reship a new item if an item arrives damaged or defective. The customer will be responsible for reporting the issue in a timely manner. Please do not allow too much time to pass before letting us know. Please note, the promo shipping rates does not apply with exchanges. We are actually paying for the majority of shipping charges when the promo shipping option is selected. We can only do this on the initial order only. The real actual amount of the shipping charge will be charged to your credit card for exchanges. Items received may be slightly different than what is pictured. Manufactures like to update their products regularly and we may have an older picture displayed. Please rest assured we will always try and ship you newest version available. Please do not refuse delivery on your order. This will incur return shipping costs. In the event an order is refused when attempting a delivery. A credit will be issue for the order once it is returned. However any shipping fees we incurred on the order will be deducted. For example If you received free shipping on an order and the order is refused, the original cost of shipping the order as well as any return shipping fees will be deducted from your credit. We ship by UPS, Fedex or USPS. Someone must be home to sign for the merchandise if living in an apartment. If you are not there the first day, they will make two more attempts. After the 3 attempt, the package will be returned to us at the customers expense. The customer will be responsible for any return shipping cost involved. Here is our standard for selecting the shipping carrier we use for the promo shipping. **PLEASE NOTE, PRIORITY MAIL IS A 2 TO 3 DAY SERVICE THAT IS NOT GUARANTEED BY THE POST OFFICE. IF YOU URGENTLY NEED AN ITEM DELIVERED BY A SPECIFIC DATE, WE RECOMMEND USING UPS NEXT DAY, 2ND DAY, OR 3 DAY AIR SERVICE AND NOT PRIORITY MAIL. Order over 1 pound and less than 7 pound or under $100 will be shipped FEDEX SMART POST or UPS SUREPOST. Orders over 7 pounds or over 100 dollars will be upgraded to UPS Ground or FEDEX Ground. Some restrictions do apply. Offer good only to a valid address in the lower 48 States of America. Excluded overweight and over sized items. We urge you not to use this shipping method if you are in a rush to receive your package. We reserve the right to ship with any carrier of our choice using any method we choose. Other shipping methods are available at standard shipping rates. Most orders ship the same day if received by 12:00 pm; however we do ask for 2 to 3 days for shipping. A tracking number will be provided via email along with invoice. Please allow 3 to 7 business day for delivery. For any questions, please call (949) 215-7585. All international orders will ship via through the post office. Some orders may incur taxes, duties or other fees when entering your country. We do not know or have any responsibility of these charges. Please check with customs in your country. Step 1: Add items to your shopping cart. Step 2: Check out after adding all items to shopping cart. Step 3: Fill in the shipping information. Step 4: Pick the appropriate shipping method and apply. Your shipping rate will automatically be generated. THE CUSTOMER IS RESPONSIBLE FOR ANY CUSTOM DUTIES CHARGED BY YOUR GOVERNEMENT. International order may take up to 7 business days for shipping. International orders typically take longer to ship because orders must be consolidated before shipping, and credit cards must also be verified by the issuing bank. This process can take up to 7 business days. Please note that there are weight and size constraints when shipping with USPS. Any oversized or over weight items will not be accepted the Post office. These items will be cancelled from the order. TO SET UP A WHOLESALE ACCOUNT, PLEASE FILL OUT THE FORM ON THE PAGE BELOW. PLEASE MAKE SURE TO UPLOAD A LEGAL DOCUMENT SUCH AS A BUSINESS LICENSE ORDER SELLERS PERMIT ALONG WITH YOUR BUSINESS INFORMATION. WE WOULD NEED THE FOLLOWING INFO TO COMPLETE YOUR REQUEST. IT CAN ALSO BE EMAILED DIRECTLY TO THE EMAIL ADDRESS BELOW.